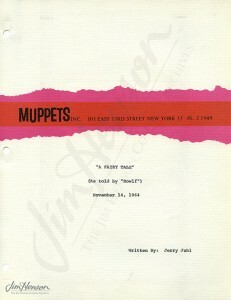 Having produced a black and white program, The Muppets on Puppets, for the Hersey, PA public television station in 1968, Jim went back the following year with his colleagues Don Sahlin, Frank Oz and Danny Seagren to tape three additional programs in color. These went beyond explaining what puppets are and included instruction on how to make your own puppets. The 1968 program, clocking in at a full hour, gave Jim lots of time to explore all different types of puppetry. He also gave audiences a leisurely chance to see behind the scenes of a Muppet puppet show. As his example, Jim had Rowlf read a mixed up story that featured characters from various fairy tales in one convoluted narrative. Audiences saw it first from the standard vantage point in front of the stage and then saw it again from backstage. 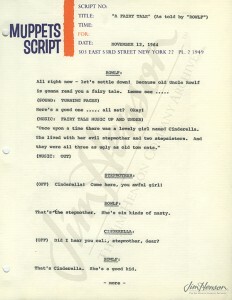 Not to waste a good idea, the script for the puppet play was one that Jerry Juhl had written back in 1964. At the time, he and Jim were pitching their Land of Tinkerdee fairy tale project. When that did not sell the following year, they joined up with Jon Stone and TomWhedon to produce a Cinderella project which, around the time The Muppets on Puppets was taped, had morphed into the television special Hey Cinderella! 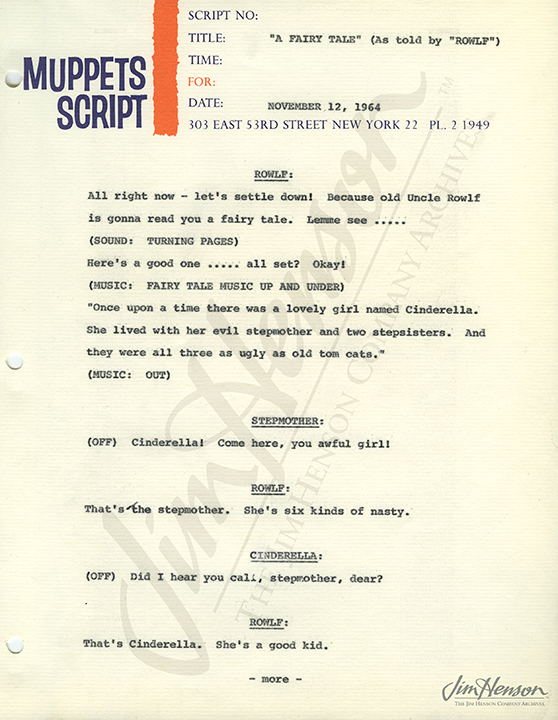 So, fairy tales were in the air and on the air waves (Rogers & Hammerstein’s Cinderella aired on TV in 1965) and Jim found a place for Jerry’s charming script. Learn more about Jim’s puppetry programs created for public television in Hershey, PA and his proposal for a network series, The World of Muppets. 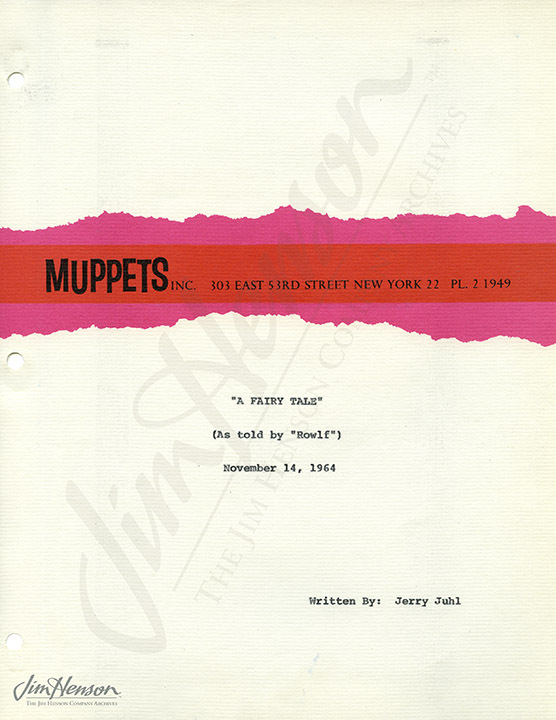 Script pages from Jerry Juhl’s 1964 fairy tale featured on The Muppet On Puppets. This entry was posted in 03-March '69, 1969 and tagged Danny Seagren, Don Sahlin, Frank Oz, Hershey, Jerry Juhl, short, The Muppets on Puppets. Bookmark the permalink.